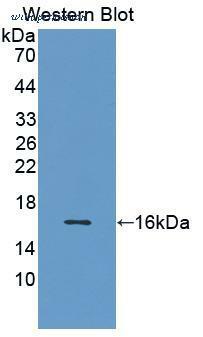 Figure A. FITC conjugated Mouse anti Rat CD3 ( MCA772F ) and PE conjugated Mouse IgG1 isotype control ( MCA1209PE ). 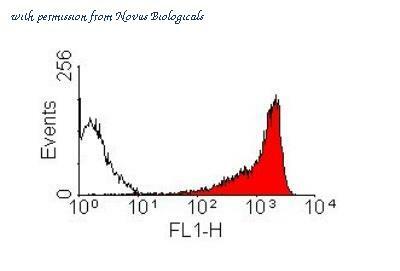 Figure B. FITC conjugated Mouse anti Rat CD3 ( MCA772F ) and PE conjugated Mouse anti Rat CD90 (MCA47PE). 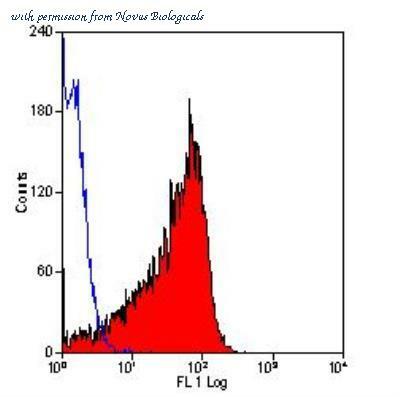 All experiments performed on red cell lysed rat blood gated on lymphoid cells in the presence of 10% rat serum. Data acquired on the ZE5 Cell Analyzer. Published customer image: . 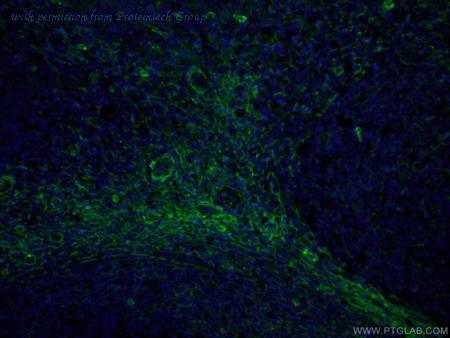 Mouse anti Rat CD90 antibody, clone T11D7e ( MCA04G ) used for the identification of Thy1.1 expressing cells in Wistar Rat retinal tissue by immunofluorescence on formalin fixed, paraffin embedded sections. Image caption: . Immunohistochemistry of DPP4 in retinal sections. From: Dietrich N, Kolibabka M, Busch S, Bugert P, Kaiser U, Lin J, et al . (2016). The DPP4 Inhibitor Linagliptin Protects from Experimental Diabetic Retinopathy. PLoS ONE 11(12): e0167853 . 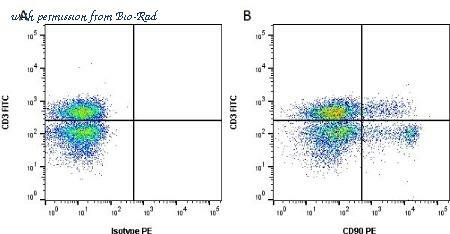 Flow Cytometry: CD90/Thy1 Antibody (OX-7) [NB100-65543] - Staining of rat thymocytes. 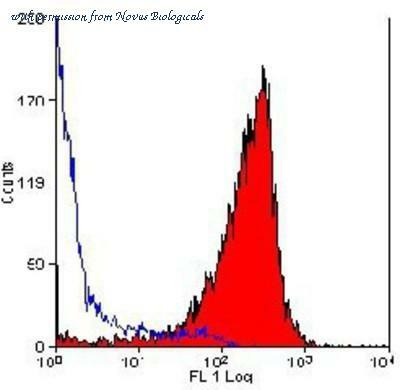 Flow Cytometry: CD90/Thy1 Antibody (OX-7) [NB100-65543] - Staining of rat thymus with MOUSE ANTI RAT CD90 (THY 1.1). 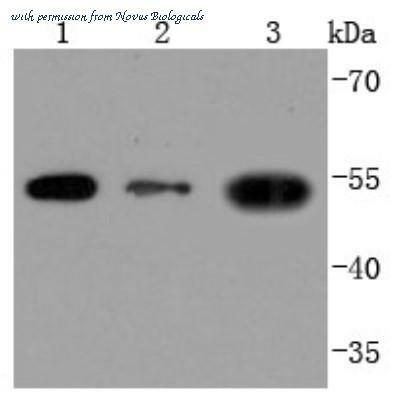 The CD90 antibody from Proteintech is a mouse monoclonal antibody to a recombinant protein of human CD90. This antibody recognizes human,pig,rat antigen. 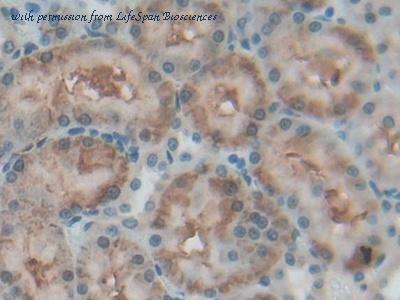 The CD90 antibody has been validated for the following applications: IHC, WB, ELISA analysis.